Gene Blevins covering the launch of the Space Shuttle Discovery. On Feb. 1, 2003 I witnessed and photograph one of my most incredible events in my 25 years in photography: The space shuttle Columbia crossing over the skies of central California at the beginning stages of breaking up on reentry. Aerospace photographer William Hartenstein and I took photos of Columbia crossing over the Sierras just south of Bishop CA. I noted to Bill that I saw a big red flare drop from the shuttle before cross over the Sierra Mountains toward the east, but we didn't think much of it at the time. Bill had shot the launch of Columbia two weeks prior and made a call to listen in on the landing procedures. Within a few second he told me that "They're all gone." I replied: "What do you mean they're all gone? We just saw the shuttle go by 10 minutes ago." But Bill knew that the crew had died in a reentry mishap. Bill said that Houston lost radar contact and reports were coming in from Texas that the shuttle had broken up in the sky. I replied that I knew I saw something come off before crossing over the mountains. Months later we all knew what happen and both Bill and I were involved in the NASA investigation of the crash because we both had taken the first photos of the beginning stages of the shuttle breaking up over California. Two and half years, two weeks and two trips later, Bill and I returned to the Kennedy Space Center to shoot the launch of Discovery, the first U.S. manned flight since the shuttle tragedy. This was going to be my second space shuttle launch. In that time a lot had changed in digital photography and so had my equipment. 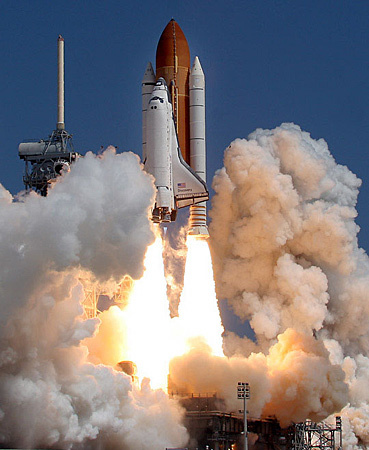 Even with all of those years of experience in photography when you get into something like covering rocket or space shuttle launch (I started this in 1999) it's not what you already know but who you know that will show you the do's and don'ts and what works and what doesn't. 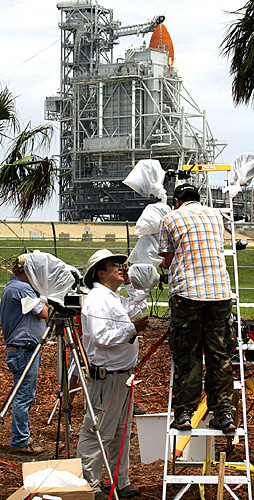 Nikon's Ronal Taniwaki helps a photographer set up a remote before the launch of the Space Shuttle Discovery. 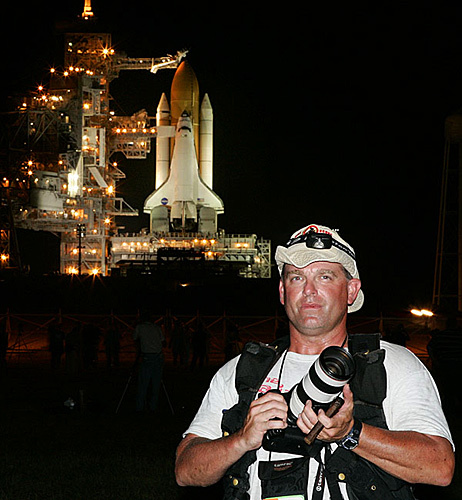 My long-time friend William shoots for Aviation Week Magazine and has been shooting the space shuttle since the 80's. He has helped me with his experience in remote timers and remote camera boxes. A lot of the aerospace photos I've shot would not have been possible without the knowledge from William and his insight on the shuttle and how it works in flight and space. At a shuttle launch you will see a lot of photographers with their own creations and ideas on how to trigger their cameras. On Discovery's launch there were 2,600 media credentials issued to journalists from around the world. Another number for you: There were 190 still remote cameras set up around the launch pad to try to capture Discovery's lift off. We have covered numerous missile launches at Vandenberg Air Force Base located on the central coast of California, as well as at the Kennedy Space Center in Florida. But I needed to make these remote boxes to protect the camera from all the elements of the weather at the launch site in the KSP. We bought 7-day timers from Home Depot and had them converted by a movie prop guy to make them work on a 9-volt battery. The way it works is the timer wakes up the camera by detecting sound and starts shooting a split second later. I had this set up connected to a Canon 20D. My remote boxes were made from darkroom 11 inch x 14 inch B&W paper holders and it worked perfectly. The remote timer also has a front door that we rigged up with a solenoid. When the camera starts shooting the doors opens so the camera stays protected from the elements all time it sits waiting for the shuttle launch. This contraption keeps the camera and lens free of dirt, dust and other crud that might get in there otherwise. There is a lot more moisture and humidity in Florida than Vandenberg so I got a fan from Camping World that I was able to rig up inside the remote boxes that ran on 4 D size batteries. The fan can last up to 300 hours running time to help keep things dry and prevent any fogging of the lens from happening. Obviously it takes a lot of hard work and time to put all this together and programming the timers to turn on and off during the launch window is very tricky. But it is necessary because we might have to keep our cameras out at the launch site for up to 7 days without being able to go back out to reset and check everything. From the press site at the KSC you're about 3.4 miles away from the pad. For this historic launch of Columbia I used a Canon EOS MKII with a 600mm and a 2x extender along with a Canon 20D with a wide angle lens tripped with a Pocket Wizard radio trigger. Liftoff of the Space Shuttle Discovery. body shook and my ears rang from hearing the roar of the engines … the ground rumbled like an earthquake was happening. All you could hear at the press site as clock ran down to "5-4-3-2-1" were other photographers yelling "Oh God they're going to launch!" The next thing you heard were people shouting "Go Baby Go!" and the sound of the roaring engines along with hundreds of motor drives and clicking shutters. We made two trips back to KSC to cover this launch, along the way enduring 90 to 100 degree heat and humidity as well as mosquito bites! After the first delay because of a bad fuel sensor, we flew back to Southern California for 6 days to catch up with work at home. Once NASA made the call to launch again on July 26 we got on the phone and booked our flights back to Florida. The sad thing about it all is that the "show" is over within 2 minutes! Then it's back to the laptops to download the images and then wait about 3 hours to get out to the pad to retrieve the remote cameras … hoping that all they all fired. I've been shooting action news for over 20 years. Through my work I've found the fun and challenge of aerospace photography. Thanks to Bill Hartenstein for getting my interest started in this field. With both our skills in photography we've been able to work together and help each other out, sharing exciting times and great photos! Final note: A lot of sweat, time, money and lack of sleep when into this double trip to the Cape and it all was worth it once you see all the photos that come from it. Now it's back to the brush fires in California and the wait begins till the next launch of the shuttle??? ?